In this EXCLUSIVE interview, Modern Drummer DIGS DEEP into the mind of one of drumming's GREATEST masters. 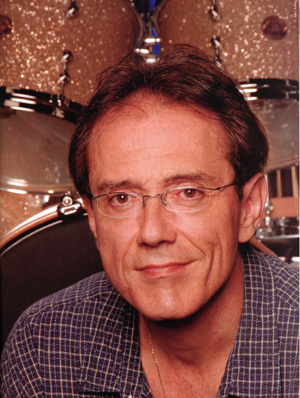 Vinnie Colaiuta has a message for you: Kill your idols. And that may mean killing every notion of technical mastery or virtuosic artistry that you associate with the drumming genius from rural Pennsylvania. For Colaiuta is passionate about many things, but nothing fires his ire like the overindulgent, lazy, non-musical thinking that he believes permeates many corners of the popular drumming community. He has long since tired of those who approach him with eyes wide, demanding answers of the eternal questions: "How did you possibly play that, invent that, create that, accomplish that, and master that?" "My outlook on drumming is very visceral and sort of conceptual and wide now," Vinnie explains from Madrid while on tour with pianist/composer Herbie Hancock. "It's not tunnel vision. And because of that, my concept is, 'Look, if you hear me play, you're going to get it or you're not going to get it.' You're going to get what you're going to get out of it. And the rest of it is, we're all human and we all have the same challenges and processes that we have to go through." We may all be human, but some of us are more in-human and gifted than others. Whether you marvel at Vinnie's extended improvistations with Frank Zappa, Randy Waldman, Allan Holdsworth, Karizma, or Jing Chi, or you simply enjoy the grace of his timekeeping with the pop elite, including Celine Dion, Ricky Martin, LeAnn Rhimes, Faith Hill, Megadeth, Andrea Bocelli, and Sting, there's no denying that his drumming is special on numerous fronts. Every drummer has his or her favorite Vinnie track, whether it's "Joe's Garage" (Frank Zappa), "Spokes" (Allan Holdsworth), "Stay With Me" (Gino Vannelli), "Seven Days" (Sting), or "Aja" (The Royal Dan). But all these recordings have one thing in common: consistency. The man does it all, with a trademark, signature sound and unerringly musical approach. Over his nearly thirty-year career, the now fifty-year-old drummer has maintained a grueling schedule, owing to the fact that everyone seemingly wants a piece of his talent. And somehow it has only served to make him better. The contemporary Colaiuta plays better groove today than he did twenty years ago, and when the chance to burn arises, he is no less thrilling with Scott Kinsey (or on numerous Tone Center projects) than when he played "Five Five Five" with Frank Zappa in 1978. 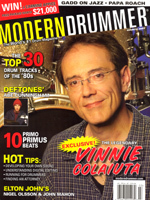 Perhaps no interview can fully reveal Vinnie Colaiuta's concepts, his session approach, his improvisational methods, his technique, or his talent. Perhaps we can only catch a glimpse of him in the moment. Vinnie is a hard man to pin down, and a harder one to interview. He sees the big picture where most see tiny pixels, and he relates his experiences through a lens that few can understand, and even fewer have seen. He won't be constricted to sound-bite answers. 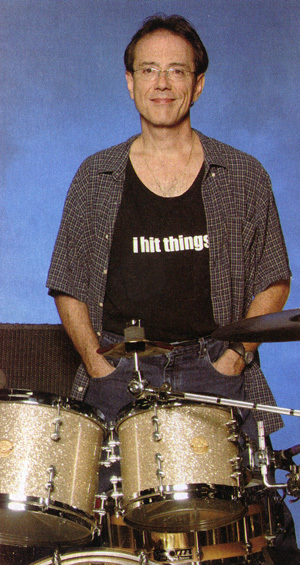 Vinnie Colaiuta is, like all great artists, inscrutable, complex, visionary. You have said that when you go into a session now you can gauge where the musicians are coming from, that you can scope out their attitude. How does one do that? If you're sensitive to people and musicians, it would follow that you would read people as well. Yet you could also have this bizarre psychological filtering going on. So if you're sensitive to other musicians, you could be overly sensitive. Let's look at the semantics of what it means to be sensitive. I'm not talking about being sensitive in the overly emotional sense, but rather in a perceptive sense. If you have psychological issues, that's your own thing to be aware of, whether or not you're affected by what people say of don't say. That points back to how stable and confident you are. So when I talk about being confident, I'm talking about being stable and secure. I'm not talking about being arrogant. If I'm talking about gauging what a musician wants, that is developed intuition. Really, just being there so that you can function in the musical environment, optimally. You're not there to show off a bunch of crap or be the center of attention. You're there to blend in and be a part of it. If you do something that's inspired that other drummers might listen to, you're not doing that to being attention to yourself. If you do it in such a way that it enhances the song, and the other musicians notice it without thinking, "That guy did that and it distracted me," then you're really arrived. Does the "blending" concept pertain to a Faith Hill gig, where the audience has no idea that you've played more complicated music, but you provide a perfect cushion for her? Yes and no, but it's beyond that. It's not about me providing a cushion for her. You could say that that's one of my functions. It's about me being there and in it and integrating so that we all feel comfortable and the music becomes something a little better. That the audience has no idea what I can do is inconsequential. If everything that I've learned can somehow blend together in order for me to do that without people being aware of it, well, that's a good thing. It's all contributing indirectly to what I'm doing at the moment. If anything I've done in the past doesn't make the moment better, then it doesn't matter. It all contributes if you've allowed it to integrate inside yourself seamlessly so that you're not thinking, "Man, I have all these chops and I can't use them." If you're thinking that, you're really not "in it." You're not allowing everything that you've learned to place you in the present moment, regardless of how much or how little you've played. There's a lot of black-and-white thinking, like, "He has these chops that he doesn't use." Or some guys say, "I have chops and I can groove." Like it's just about chops and groove. So guys try to escape the chops stigma by saying, "I can groove too." That is really black-and-white. There is so much more than that. There's a whole color spectrum and awareness that isn't represented in that line of thinking. Drummers always say, "You have to play for the song." First of all, you have to want to play for the song. You have to enjoy doing that. Then you'll start seeing the musical value and fulfillment in that. You'll sense it, feel it, and know it. You'll sense the synergy in it. You won't even think, "Man, I could have done this really cool lick there." That is defeatist, non-musical thinking. Any time you strike the drums you have to be aware that you're creating a musical event. If you think of it as something more or less technical, you're thinking reductionistically. If you think, "I have to play the song well," it can become a chore to develop so people will like you, versus, "I see the value of this and it makes sense." That's not to say that you can play anything and use your own criteria to deem it a musical event. There are laws of music. I could sit down and play a drum solo and think, "I will baffle them." What I see happening a lot within drumming is a microcosmic example of what's happening in society, which is sensationalism. Sensationalism was once the domain of sideshow barkers selling cure-all tonics and tickets to see the bearded lady, but there was always a place for art. But now if it's not sensational, its value is diminished. That kind of mentality contributes to short attention spans, the inability to read a book or to be able to read and write something more substantial than a cursory email. If I play a drum solo, yeah, it will reveal a lot about how much I practiced and that I can twirl sticks and do different rhythms with each foot. That comes from hours of practicing, focus, repetition, and integration, and if you're not mentally, physically, or memory-impaired and you have a modicum of talent and you put enough time into it and you want to do that, you will achieve it. But then you're creating your own context. If you do that stuff free-form and do it to wow and dazzle people, then I say try this: Take all those licks you've blended together and slow the tempo down or change the tempo, and A) put it in a specific context that requires you to obey particular parameters in terms of an idiomatic form that you're going to play; B) play it within a stylistic genre; C) play it within a song form; and D) do that with other musicians in real time reactively as well. Now the story changes. People wonder why I don't do clinics. That's why. Because you're not getting the context. It's like I'm selling you something. Where is the context? You can't just sit there and be bereft of context. But do kids want to hear that? Hell, no. They just want razzle-dazzle - or a software program that lets them create this stuff in ten minutes without any musical training. Do you really believe that? I think many kids love to play drums simply to be a part of the music and to play for the song without any technical concerns. Are you speaking to the mad drumming contingent who lives for technique? What percentage of what you see in clinics is kids just sitting down on the drums and playing a song without really showcasing any kind of technique, versus kids who are coming out of the woodwork basically lighting fires with their sticks every two minutes? Yes, people want razzle-dazzle at a drum clinic. What does the term "clinic" mean to you? A clinic is a short condensed educational presentation. Would that be a good working definition of it? So how does razzle-dazzle apply to an educational presentation? Let me break the physical limits of what's possible on the drumset, and then what? What else does it mean? I would think it's about learning to play music. Yes, but how do you apply that? How does that emerge causally from putting the focus on razzle-dazzle? How do you learn the musical aspect of that? That takes years. It takes musical interactivity. If you rip the drums apart all the time, how does that apply to a musical situation with other people? How does the musical education follow from putting all the emphasis on sensationalism? That's the correct answer. That's all I'm saying. I'm not saying this to you as some grumpy guy who doesn't have any chops denouncing people who do. No. I have chops. And I deeply respect everyone who does. This is just my viewpoint. You're really hearing how I think and my perspective. But people say, "Yeah, well you do it." I do it and I don't do it. You play with passion and you do things for certain effects for certain reasons, but I don't sit down with a freaking meter on my leg to see how many singles I can play. You sound totally sick of the entire "Let's hear Vinnie go wild" line of thinking. You sound pretty fed up to me. I mean, wow! I'm just not interested in it, you know? I think there are many drummers out there who love to hear you play as you did on the early Kenny Pore records, or with Bill Meyer or Steely Dan, or any number of records where your groove is as beautiful as any other aspect of your playing. When I first heard you on Al Kooper's Championship Wrestling record, your groove really stood out. Drummers like Zach Danziger here in New York really took notice. Zach Danziger is very talented. You can hear him with Wayne Krantz and he sounds great. I'm talking about people having tunnel vision and sitting there and analyzing what Zach does and seeing the technique versus understanding that he has musical freedom. I bet I can speak for Zach, that he doesn't sit there with a freaking drum-o-meter! Zach tired of the razzle-dazzle. Because it's a dead end, man. There is no fastest gun. There's always going to be another Wyatt Earp. You challenge yourself because you want to feel freer and integrated with the instrument and with music. That's really what you're doing. Zach said something very valuable; he told me, "I've found another way to express myself that is satisfying to me." It's easy to twist that and say, "I will rip the walls apart and express myself." Fine. But Zach is saying that he's expressing himself musically because of his awareness and what his idea of musicality is. And the reason why he sounds so good with Wayne Krantz or Boomish is because of his musical depth. Guys will come up to me and say, "I stole all your licks." I say, "Well, they're free, you didn't have to steal them." This idea of looking at them like they are licks.... "They were Vinnie's licks and now they're mine." Like it's espionage. "Take this pill and you too can..." - fill in the blank. This is missing the point. It's tunnel vision. You don't listen to Wayne Shorter and try to steal his licks. Conceptually, he's an extremely highly developed musician. There's nothing wrong with personal development through playing an instrument, but what happens when it's treated as a sport? There is no scoreboard. Yes, granted, there has to be a standard that reveals certain things, like with a school audition. But beyond that you're in the realm of esthetic. Everything else is a descriptive language. If you want razzle-dazzle...if you want to beat somebody up, be a boxer. All this time I thought drumming was art. You've played thousands of sessions. Are there certain parameters you rely on to have a successful recording session? Sure. There are expectations and there are projections. If I expect a good headphone mix, I feel that's not too much to ask for. We're on a professional level here. It's about quality. It helps if the pre-production is good, and if the room is not so bad that it's almost like being in an anechoic chamber. And then you have the psychological makeup of the producer and the artist involved to consider. I was really struck with your interpretation of Steely Dan's "Aja" on the Jeff Richman record, The Royal Dan. How did you approach reinterpreting Steve Gadd's classic solo in "Aja"? Personally, I would rather have not done it. Steve made such a great musical statement. The solo segments we did were longer, so I approached it the way that I did. You can't approach it like Steve because that's not being yourself. What are you going to: chops-out? Don't fall into that trap of "Watch this." I played what I did because it occurred to me to paint a different picture. Even thinking you can do it better or not is counterproductive. Why would you repaint the Mona Lisa? The Sistine Chapel is what it is. Guys didn't create a sculpture back then with an idea like, "I dunno, man, that arm is a little high." And this line of thinking really applies to modern-day "production" as well. Imagine an A&R man or producer standing behind Pablo Picasso: "Pablo, babe, think of your demographic. Think of your peeps babe. Are they really going to buy this, man?" That happens today, all the time. On Visions Of An Inner Mounting Apocalypse, you interpret an entire album's worth of Billy Cobham's patterns with the Mahavishnu Orchestra. On some tracks you allude to Billy's trademark grooves, while elsewhere you make them more personal. Billy was such a huge influence on us all. I wasn't thinking about not playing Billy grooves, it just came out automatically. What he did for the songs is so right, and to me such an integral part of the compositions; and unless you're going to reinterpret the song completely differently.... For me it was a tip of the hat. I thought that's the way it should be because of what Billy did. I applaud Jeff Richman for doing all those records. They were no small task. But in retrospect I wish I didn't have to go in there and read it. We did that record in a day with charts. We were reading Mahavishnu! Those guys were a band. They played that music all the time. When you cut that many songs in a day, I'm not going to be able to memorize all of those arrangements. I don't have that kind of instant memory muscle. I just wish I'd had a little more time with it because I love that music and I love playing it. There is a great video of you on YouTube.com playing "Scatterbrain" live with Jeff Beck. It's about three times faster than the original. You also play tremendously improvisational, fast, aggressive drumming on recent records with Frank Macchia, Randy Waldman, Scott Kinsey, and Brian Bromberg. How do you approach that style of drumming differently now than when you were playing with Allan Holdsworth or Frank Zappa? That's a really difficult question. With Zappa, that event occurred like being thrust into the eye of a hurricane. You can't understand the whirlwind when you're in it. It was a turning point when Frank discovered I could do certain things and prompted me to do them. It was kind of new, versus having played different kinds of music for years and then entering every situation with an open mindset. By the time I had done Secrets with Allan, that mindset was already well developed for me. I didn't think like, "This is hard music and I'm playing fast and complicated and, oh boy, I can't wait to shine", or, "Gee, this is fulfilling and everything else I've been doing isn't." Again, that, to me, is black-and-white thinking. I don't know how much different it really was. I just don't think that way anymore. Does anything present a level of difficulty for you at this point? Whenever you try to do something you're not familiar with, it presents, or can present, a level of difficulty. But you have to look at it in a healthy way. Am I afraid of it? Will it trigger a mental block in me that's going to inhibit me? Do I need to do it? Do I want to do it? I haven't thought in those terms in quite a while. I usually find a way around it to integrate it, or maybe I'll develop it for a while, or maybe I'll just jump in. Since I've developed a certain degree of independance, if I wanted to develop another kind of independance and showcase that in my playing, I have the innate talent to do it. Lately everyone is doing the clave with the left foot. I don't sit down and spend time practicing that. Look, I'm not going to do it just because it's the hot thing to do. Even if it were a necessity, I would have to make a decision whether it would be forced or it would be another thing I would want to do. It's not a question of difficulty. I've spent a lot of time working up stuff that was difficult, and I didn't wonder if I was going to be able to integrate it into my playing. This is the same thing. I just don't feel driven to spend time with that so that people can say, "Oh, he's got that down too." There are things I'm not going to do just to be on the hot drummer list, unless I'm driven to do it. Did Segovia worry about whether or not he could play like Hendrix? Why does a drummer have to compete that way? I don't cross off a checklist of styles. I just go where my heart is. My desire drives me to increase my standard of whatever I'm doing - or not do it because I feel forced to do it. I develop something because I love it. How do you typically tune for different session? How does Faith Hill differ from Pussycat Dolls or Scott Kinsey? I generally have a pretty generic tuning, and I use that as a base and modify from that. I use 10", 12", 14" and 16" toms, an 18x22 kick, and the snare du jour, or more precisely, the snare du track. If I'm in a live situation, I want a drum that has playability, a certain amount of crack, tune-ability, and range, which is usually a five-inch drum. Metal or wood? Depends on the room. With Faith Hill, my tuning is adaptable. I have to look at the drums that I'm using. Certain drums sound thuddier than others. I'm not going for high-pitched toms with Faith Hill. I want the toms to have some meat. With Scott Kinsey, I had a lot of crack on the snare because it seemed right. Whatever enables me to speak is what I go for. A low snare wouldn't work with Scott, not on that track. I make logical choices based on the aesthetic of what I'm doing. What kind of drums, cymbals, and sounds will reinforce that aesthetic? Do you have a favorite snare drum for studio work? I have two Longo snares that sound great, some Bradys that sound great, and several Gretsch snare drums that also sound great. I also have two hybrid snare drums from Drum Paradise, and several chrome-over-brass Ludwig Supraphonic 400s. I know what each drum does when I go into a session. I listen to the characteristics of the drums and go from there. You get to a point where you know a drum well and how a certain room will affect its sound. You used to sit much lower. What happened? My back started hurting. At one gig I couldn't even stand up straight because the pain was shooting up my back. It got to the point where I felt that my back and posture weren't doing me any good. I wanted to sit higher and rebalance myself on the set. It feels pretty good now. I'll tweak an unfamiliar kit. It's easy to get used to one kit at every session. Vary your seat height by a few inches and it can affect your balance on the kit. It does mine. I like to feel balanced. My knee is mostly parallel to my hip. Do you warm up before a gig, or do you prefer to play the set fresh without a warm-up? Lately, with Herbie, we do soundchecks and we play for a long time. I'll just play around the kit during soundcheck and then play by myself a little bit. By the time soundcheck is over, we don't have much time before the gig, so I'll gather my thoughts for fifteen minutes and then change clothes. Then I'll twist the sticks around in my hands a little, shake my limbs, and maybe do ten minutes of warm-ups. Then we hit it. If I don't have that long of a soundcheck, I like to work on a pad or the arm of a chair for ten minutes. It used to be that I would do it for thirty minutes, but it really depends on how long the soundcheck is. I might do various strokes and then just hit the gig. It's nice to walk out on stage and boom! A lot of it is pacing. Don't blow your chops out in the first tune. I have to go through that psychological thing too. If the drums sound like they're getting blown away by the wind and I'm not hearing the tom-toms, I have to trust they they're being heard out in the house rather than hit them harder. That will either choke the drum or make you stiff. You have to pace yourself and relax into it. Why did you switch to Gretsch drums? I was always a closet Gretsch freak. I love the sound of Gretsch drums. While they have a very resonant pure sound, they also have a particular sound that I like. I like that I can tune them differently to produce more or less overtones and the sort of fundamental sound I was hearing from the tom-toms. At a certain point in my life I thought, "This is my voice." Why not be true to that and just play what I want to play? If I died tomorrow, I would have wanted to play Gretsch drums and let it be known that I express myself on these drums that I consider to be my voice. It's easy to say that I was influenced by my heroes that played Gretsch, specifically Tony Williams, my hero. That was his voice. But you don't see me putting black dot heads on the drums and playing a 24" bass drum. A lot of people besides me heard Gretsch drums on a lot of jazz recordings. I became aware of them on studio sessions in LA with specific people having played them. Cartage companies were sending them out on sessions because they knew that Gretsch were the real deal. I noticed how they sounded in various kinds of contemporary and pop settings outside of jazz that expanded my awareness of how they sounded and how adaptable they are. Are you playing Gretsch on every record you cut? Oh, yea. I'll go to great lengths to get Gretsch drums wherever I am. Drum Paradise has Gretsch in Nashville, as does Artie Smith in New York. I have Gretsch drums in Tokyo, as well as a kit in Europe. I'm using all Gretsch with Herbie, the New Classic Maple with tube lugs. They sound different from the classic USA Maple. They're the first new Gretsch drum design in many years and they sound great. Recently on tour with Jeff Beck I used my own Signature series, and I'll use those in Japan with Herbie. Speaking of Herbie, he and I did a session together in October with Quincy Jones; that's when he called me about doing this tour. We're doing a cross section of tunes from his repertoire, including "Actual Proof" and "Maiden Voyage". How are things progressing with your next solo album? There isn't progress because I haven't had time to write anything. I've been really busy this past year, so the record will happen when it's ready to happen. Hopefully there will be inspiration so it will be born. If I get time to write again, where I feel like I have something to say, so be it. I've been so busy working all the time, life starts to become a blur after a while. When I go home after a session, I have to shut my mind off and go to sleep, and then get up and do it all again the next day. Speaking of that, people judge you by whether or not you're constantly in the studio. If you're not, you're somehow diminished in their eyes. That's another social stigma I find to be preposterous. I basically do live in the studio. Everyone takes shots at the guy on top. Or else they get in your face and start talking to you. And as soon as you ask them, "So how are you?" the first thing that comes out of their mouth is, "Busy!" As if I'll hold them in esteem because they are busy. I just do what I do. If people like me, they like me. Do you have any particular musical ambitions left? I do, but now is not the time to go into them. I can't elaborate on that. Other than skill and talent and the personality to maneuver through all of that, the rest of it is a blessing and you have to do it all to glorify God. If I say this to people, they'll interpret it in a religious, dogmatic way. But I am talking spiritually. I'm not trying to represent myself as some bastion of spiritual goodness. It takes a level of humility and recognition of what your source is and who your source is. You have to recognize where the source came from and be grateful for it. That then filters into the personaltiy needed to maneuver in the music business. Just being genuine and true to yourself - those are all things that are immutable. Getting along with people and being as true as you can be to the music and to yourself is what it's about. I avoid using certain words that will conjure up any kind of association of inferior versus superior. That's why when I say "be the best you can be" I don't use any connotation of what the word "best" means because I don't want to suggest the idea of competition or some high skill level you have to achieve to be some gargantuan Olympian sports type. But if you can find another way to conceptualize that, you'll understand what I'm thinking or trying to say. You've fielded these technical/chops matters for so long, and your position is unique. 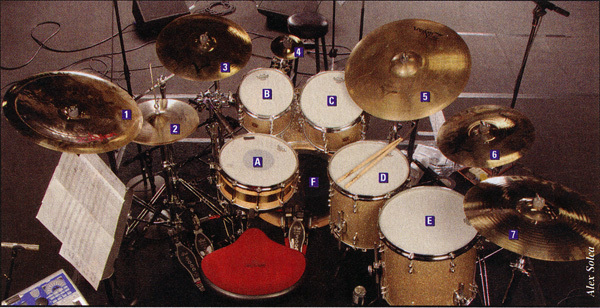 Not many drummers have reached your level of technique and artistry on the set, which is part of the evolutionary chain of the drumset. For those who don't have that skill level, what you do is almost beyond comprehension. And only people like you, Tony Williams, Steve Gadd, and drummers of that ilk know what it's like to be in that catbird seat. I'm sure there is some commonality in our view due to having arrived at a certain level, so to speak, and of having shared the experience of going through these processes. Yet at the same time we have a unique way of expressing it. We are different. But that's a lofty and humbling thing, associating me with part of the evolution of the instrument and the skills required. But again, only talking about the skill necessary to enable that to happen is reductionistic. There are a lot of guys out there with skills who have not contributed to the evolution of the instrument. It's about more than that, or about aspects and phenomena other than just skill. When you look at Elvin Jones at the time of his emergence, he took the instrument in another direction because of his approach and what he was saying. So what are you saying? It's an emotive language. It's an aesthetic. Skill is an aspect, but it's what you do with that skill, what you're saying with that skill, that matters. But it's humbling to be held in that kind of esteem with my heroes. Believe me, I am very appreciative of all of that, and I don't take it for granted. Vinnie also uses a 5x10 snare positioned to the left of his hi-hat (not in photo).